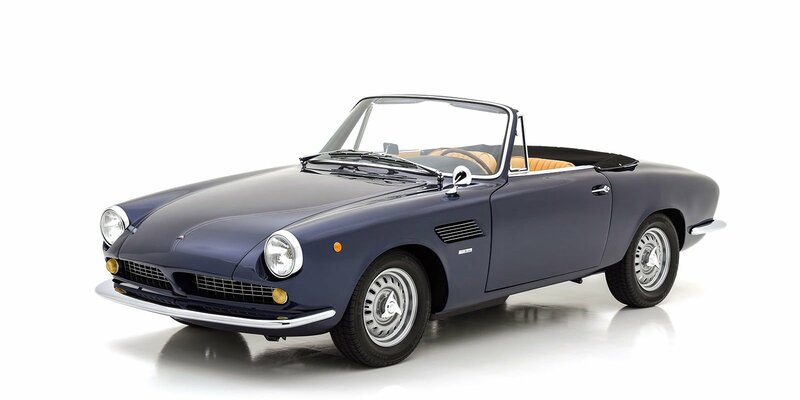 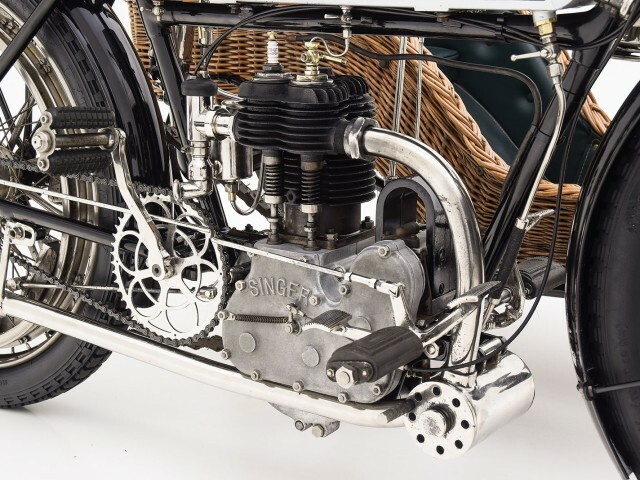 Like many early motor manufacturers, Singer – founded by George Singer in Coventry, England c. 1875 – progressed through bicycles and motorcycles before eventually settling upon automobile production, which continued until 1970 as part of the Rootes Group. 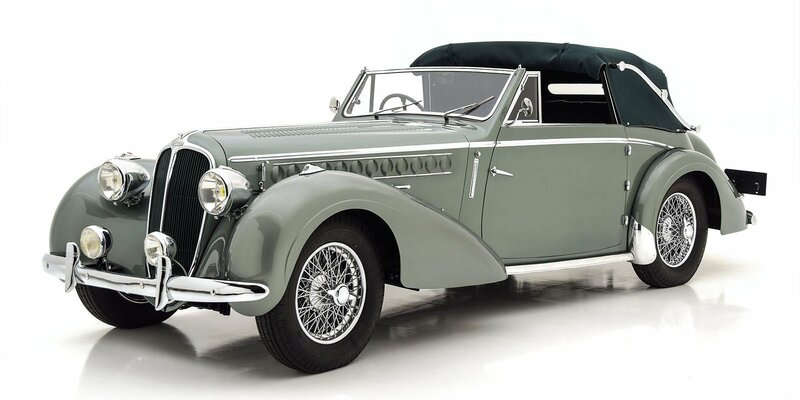 Singer also contributed to the creation of Aston Martin. 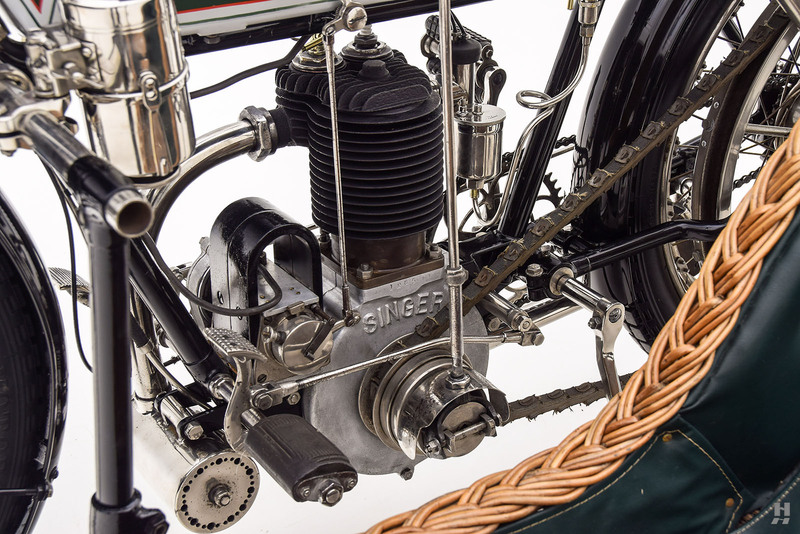 Early on, however, Singer was a pioneer bicycle manufacturer with a reputation for providing innovation, style and sturdy construction by offering: “the highest grade at an exceedingly moderate figure”. 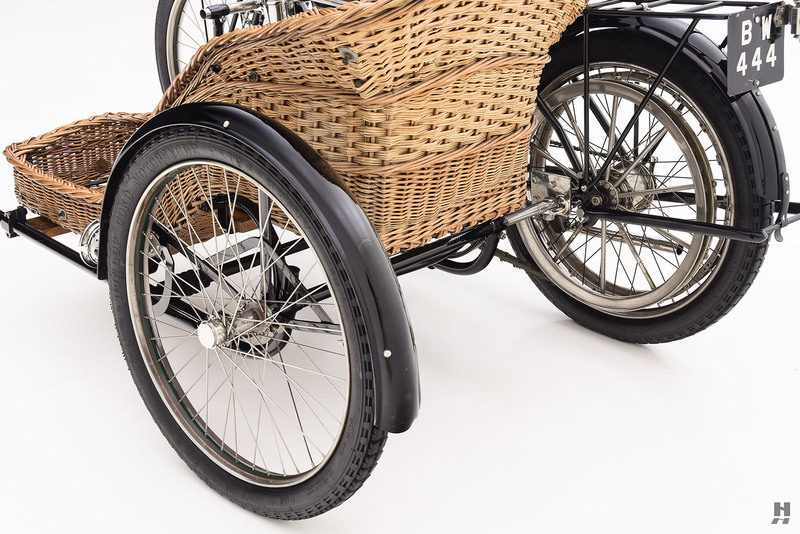 In 1901, the Singer Motor Wheel was fitted to bicycles creating a ‘motor bicycle’ and, in the same year, Singer began manufacture of motorized three-wheelers. 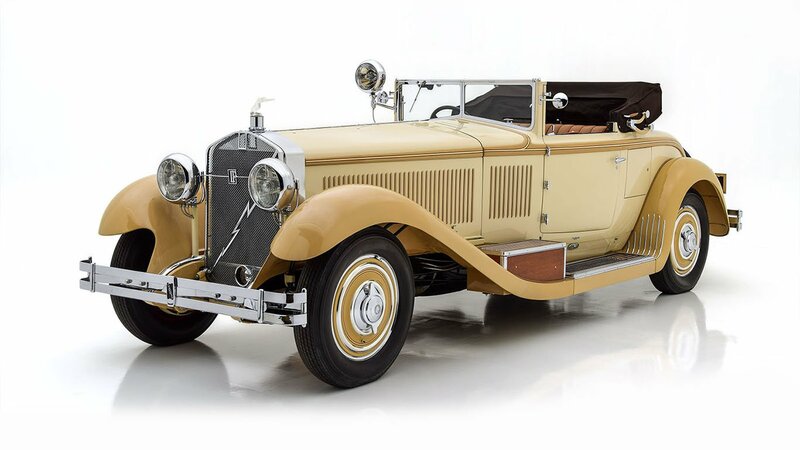 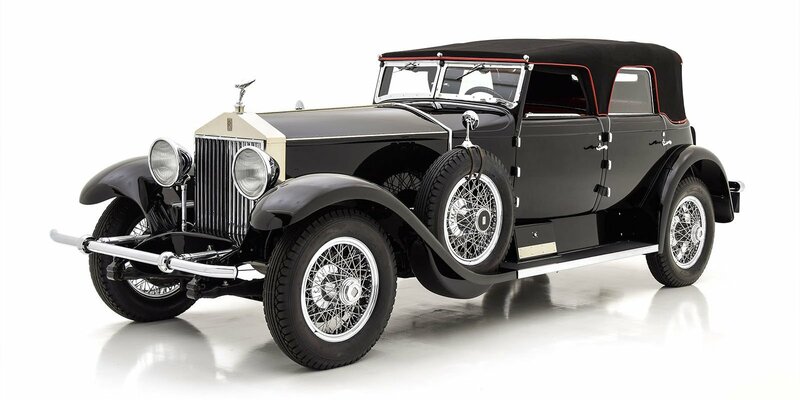 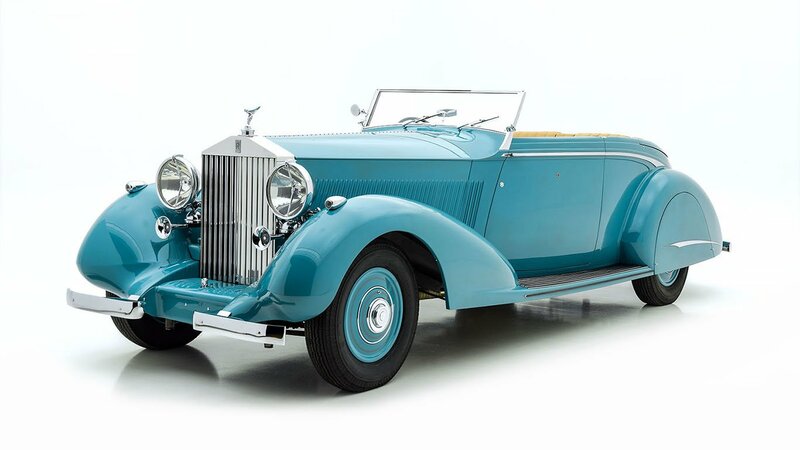 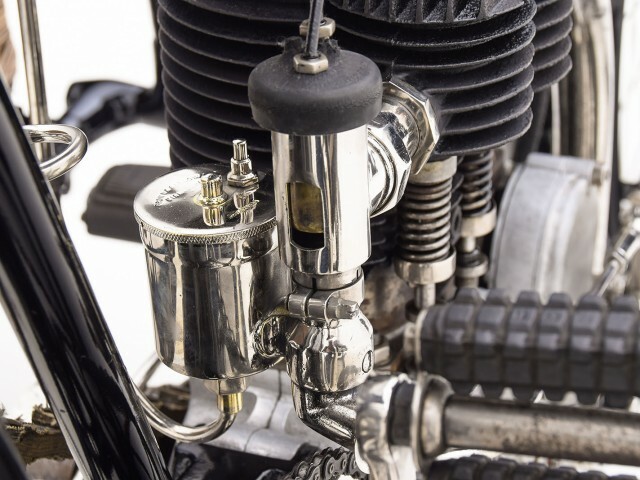 The Motor Wheel was an ingenious design, based on a patent by former Singer employee Edwin Perks and Frank Birch, that placed a 222 cc four-stroke, single cylinder engine together with a fuel tank, carburetor and low-tension magneto inside a cast alloy spoked wheel. 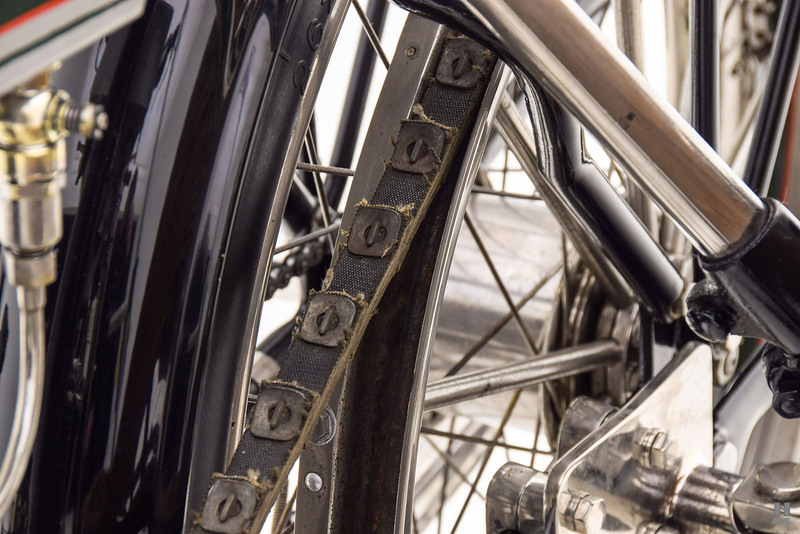 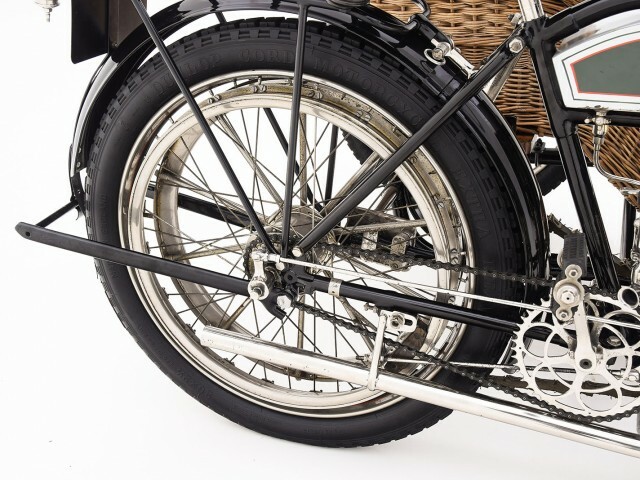 The Motor Wheel was mounted as the front wheel of the tricycles and the rear wheel on bicycles. 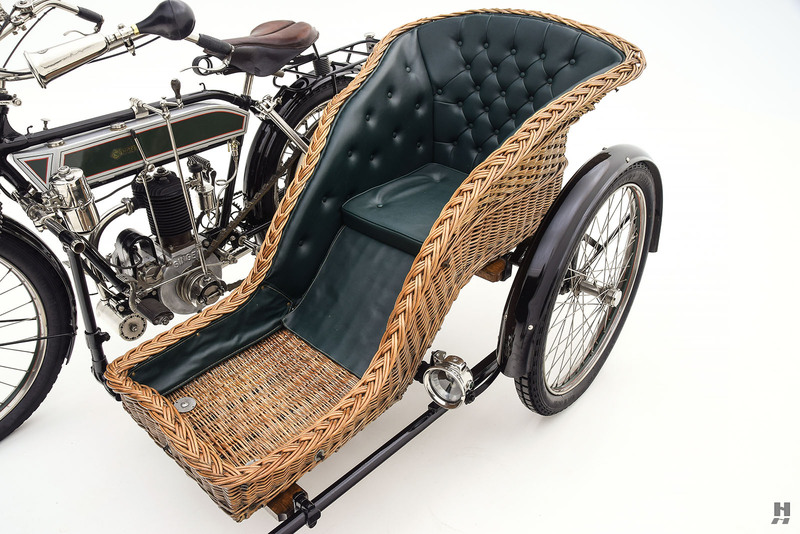 In 1904 the company created a range of more conventional motorcycles with an upright engine mounted in a cradle hung from the downtube. 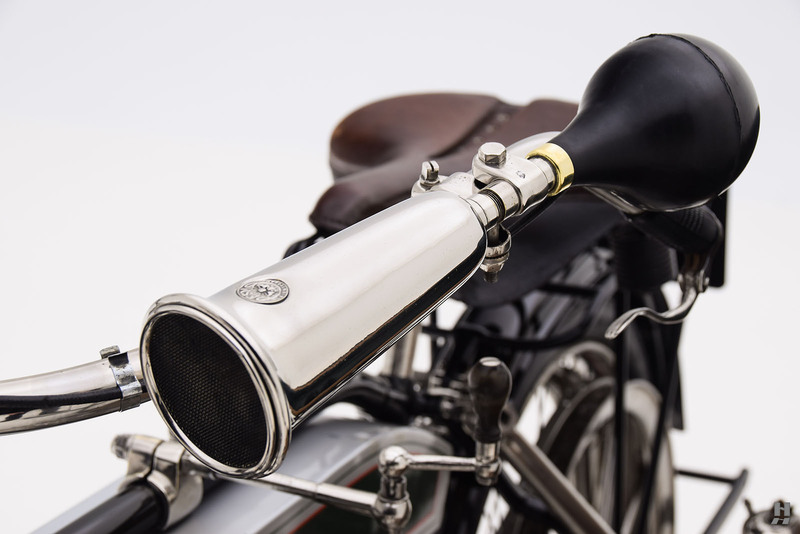 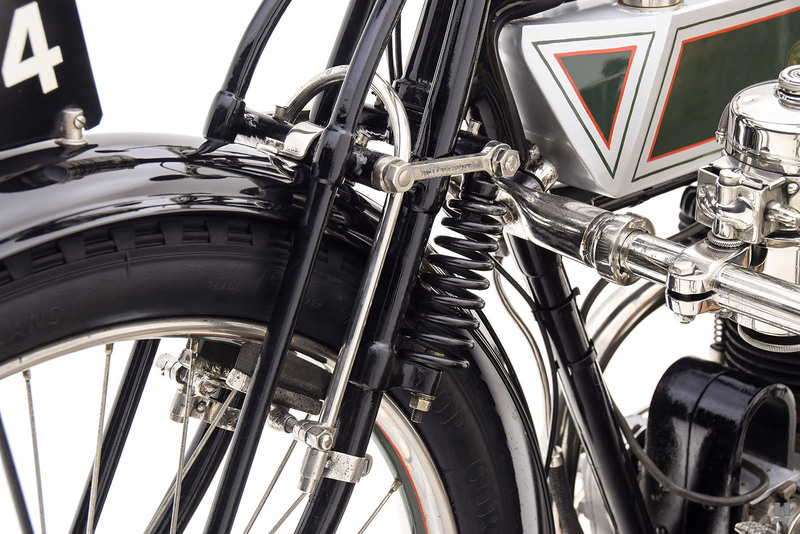 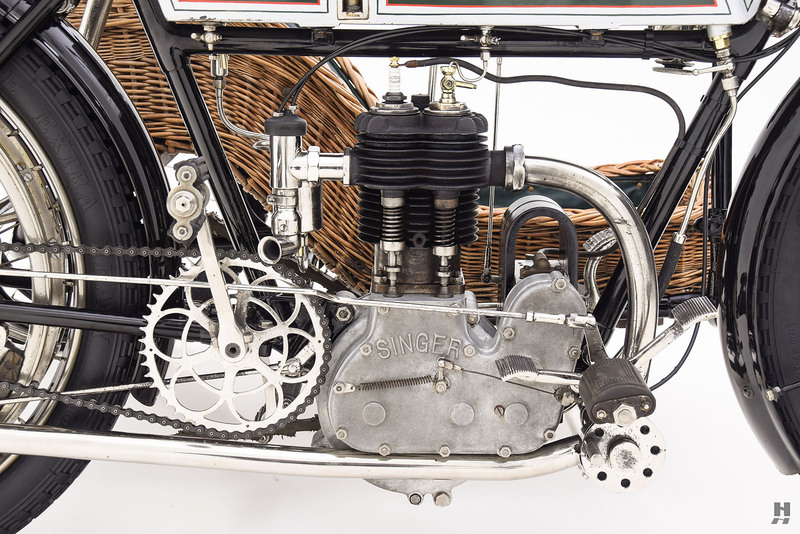 Both road racing and record breaking both helped to establish Singer motorcycles. 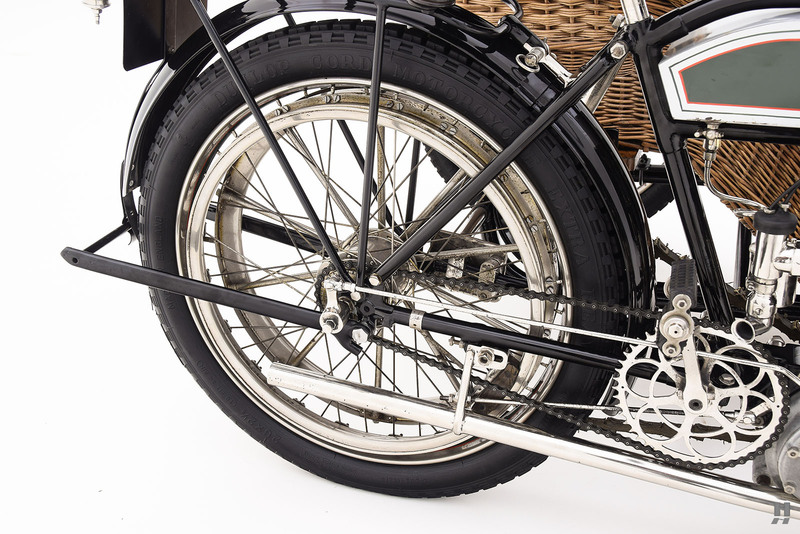 The single cylinder 2½ and 3½ hp Singer motorcycles like the one presented here displayed a simplicity of design that suggests little more than a larger diameter bicycle frame with suitably heavier tires. 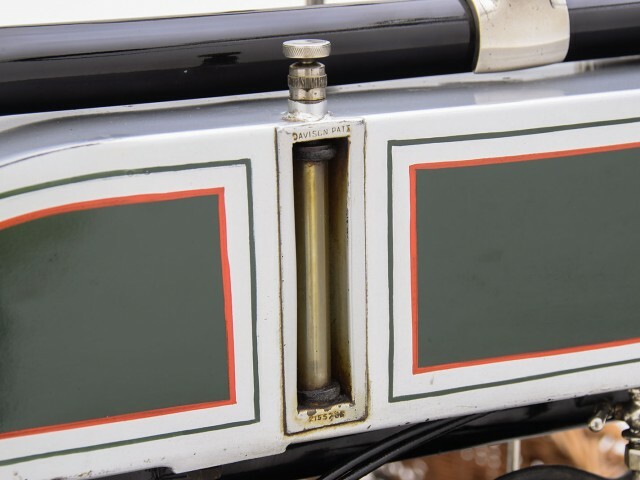 Closer examination reveals several surprises, however. 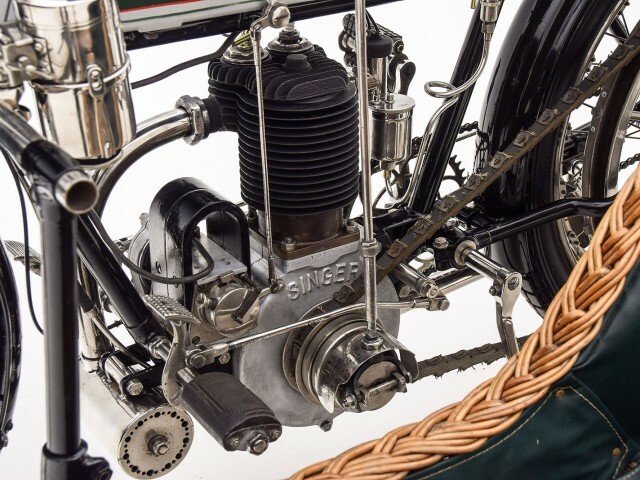 The tiny, single cylinder engine is of Singer manufacture; not outsourced, as was often the case for motorcycle manufacturers. 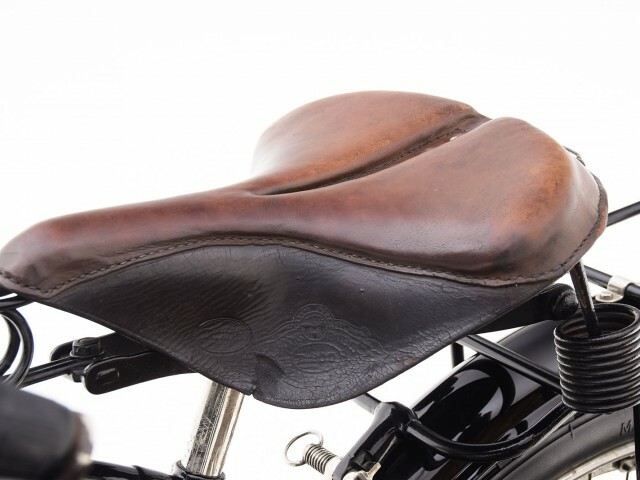 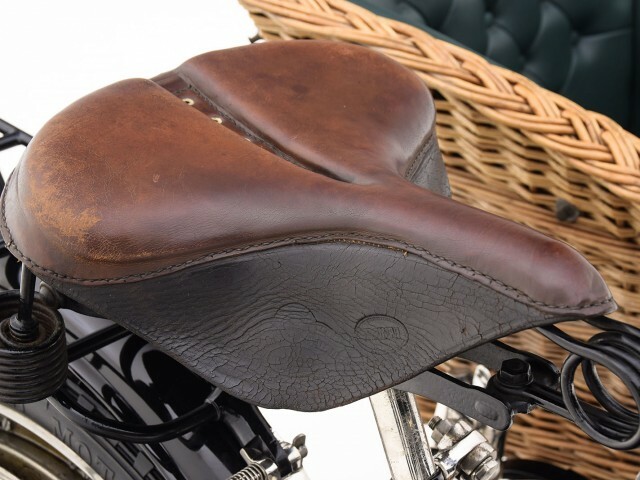 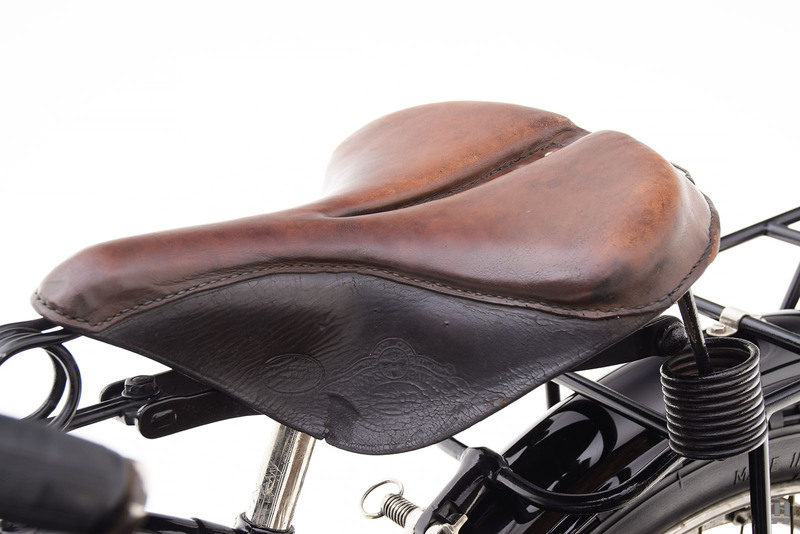 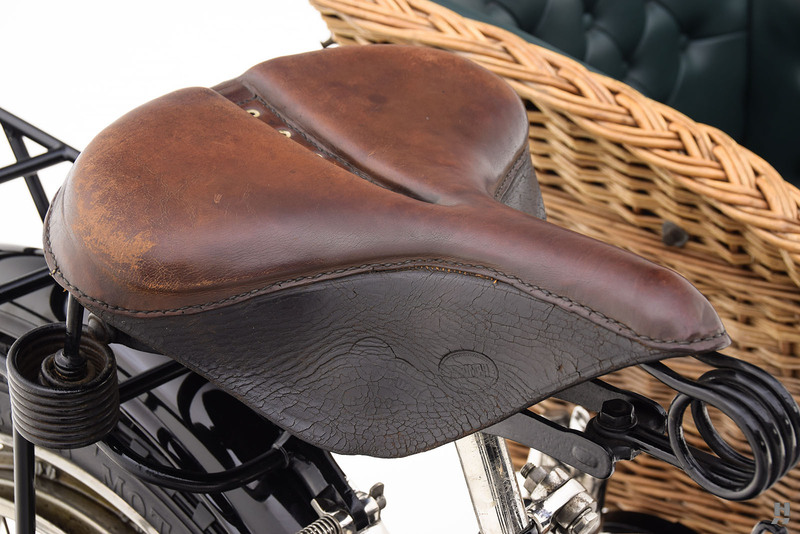 A coil and lever assembly dampens the front fork, while the leather Brooks saddle is similarly suspended for the rider’s comfort. 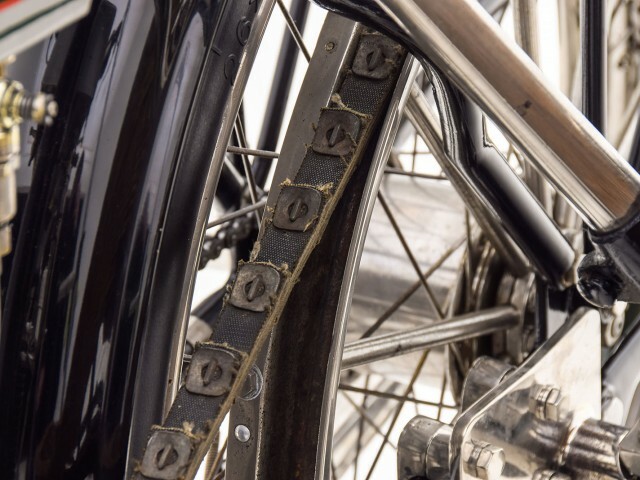 Most unexpected are the pedals, crank and chain drive for starting the motorcycle engine –like later Mopeds – before the drive is taken up by a leather belt between the engine and the rear wheel! 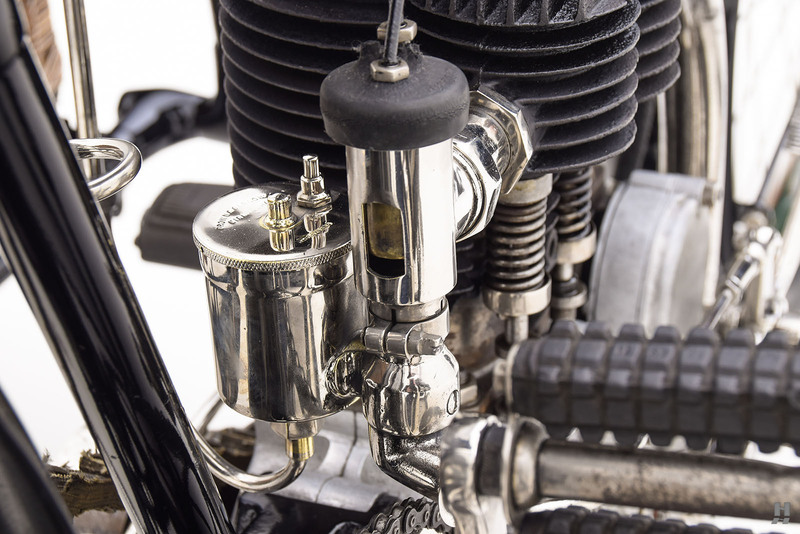 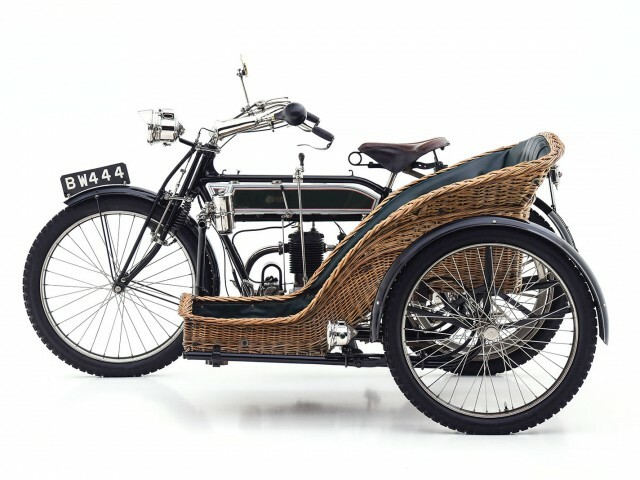 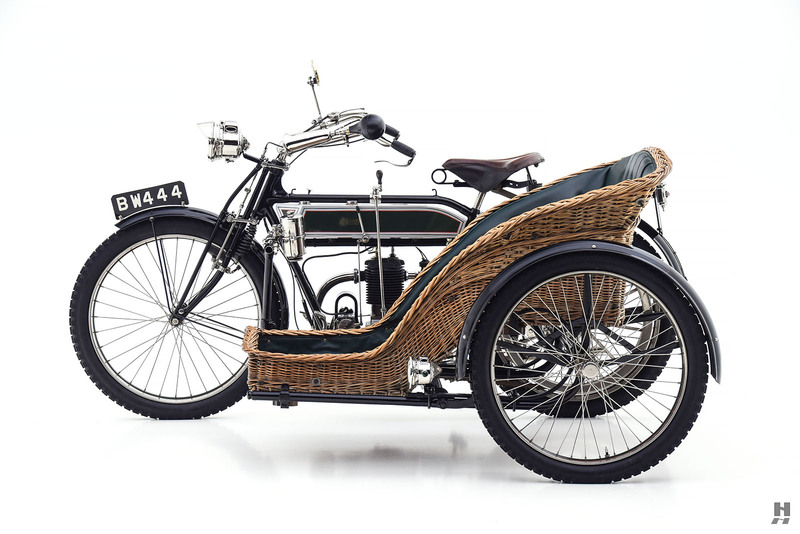 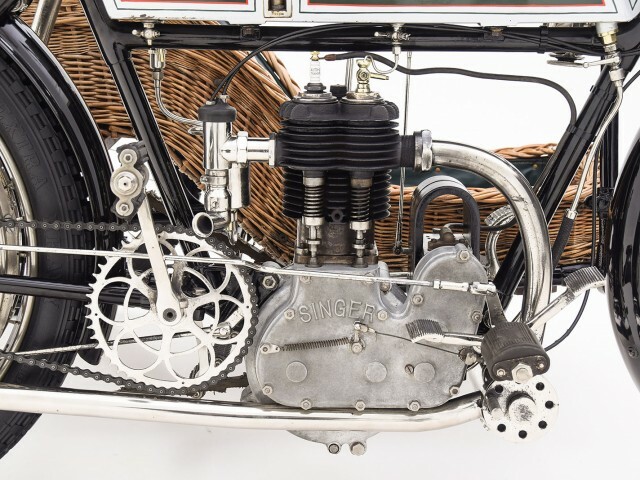 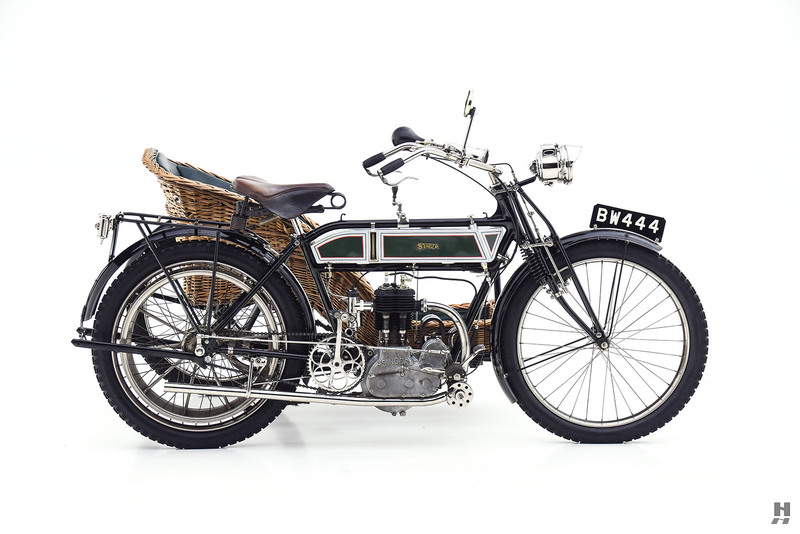 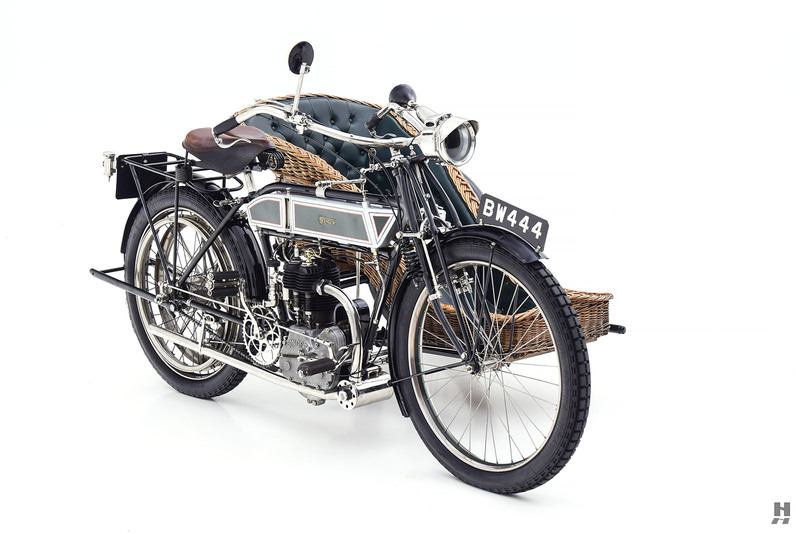 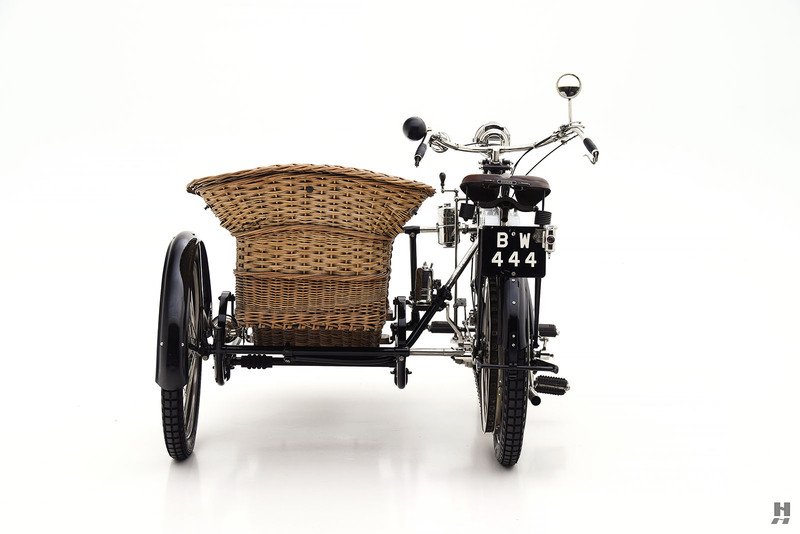 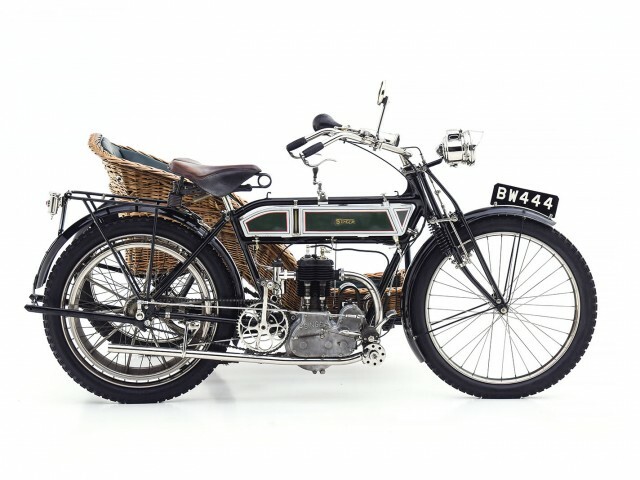 While we are still in the process of confirming the displacement and horsepower of the engine, Singer offered both 299 cc and 535 cc engines in 1911. 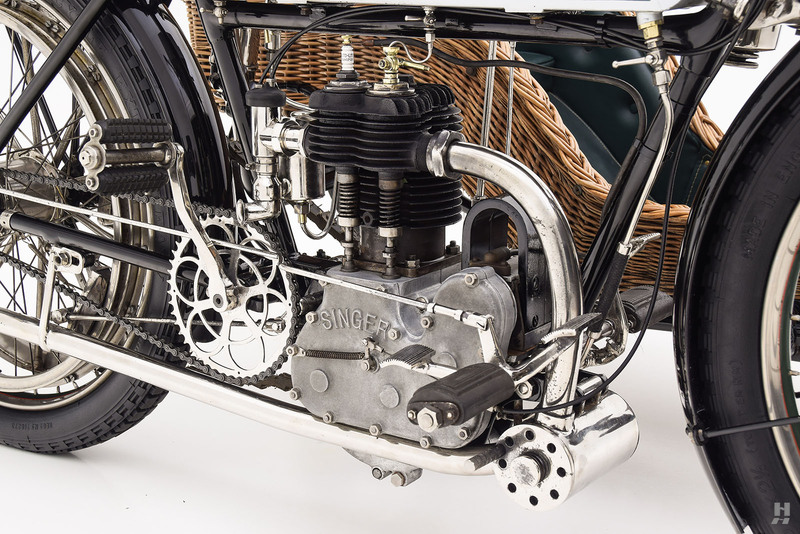 This Singer motorcycle and the sidecar are an older restoration that has been maintained to a very high standard. 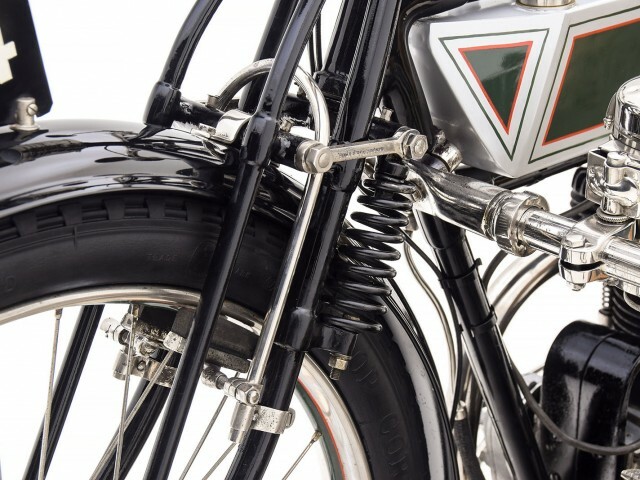 The motorcycle frame and accessory mounts are painted in black, while the engine and drive train show a nicely patinated alloy. 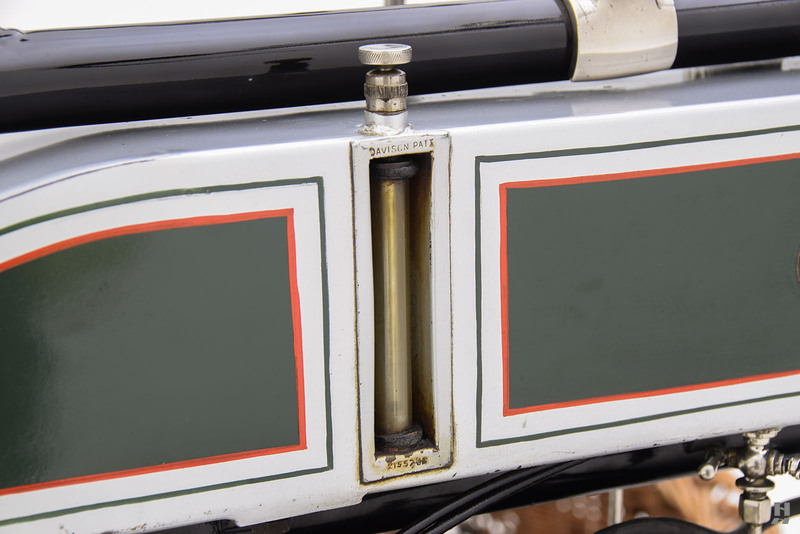 The petrol tank is painted correctly in silver with green panels and narrow red coach stripes. 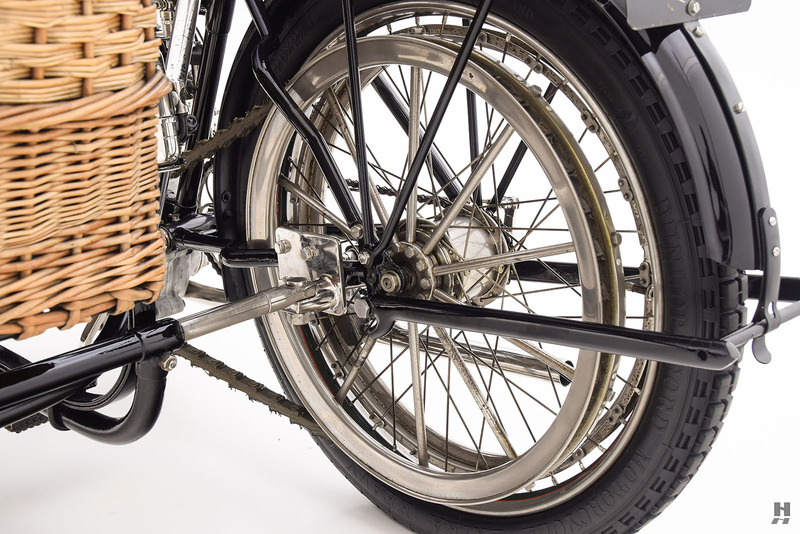 Trim is nickel plated, including a delightful Lucas ‘Kingsown’ headlamp mounted above the front wheel. 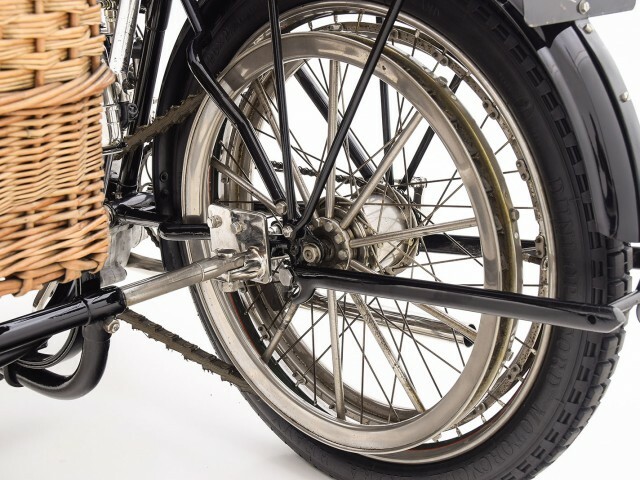 The front brake grips the rim bicycle-style, but the rear brake is actuated via an articulated shaft with a pedal mounted on the right side of the frame. 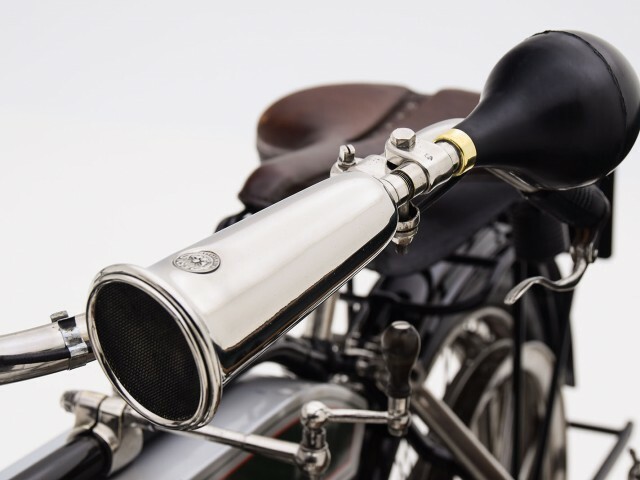 The shifter lever is mounted near the tank. 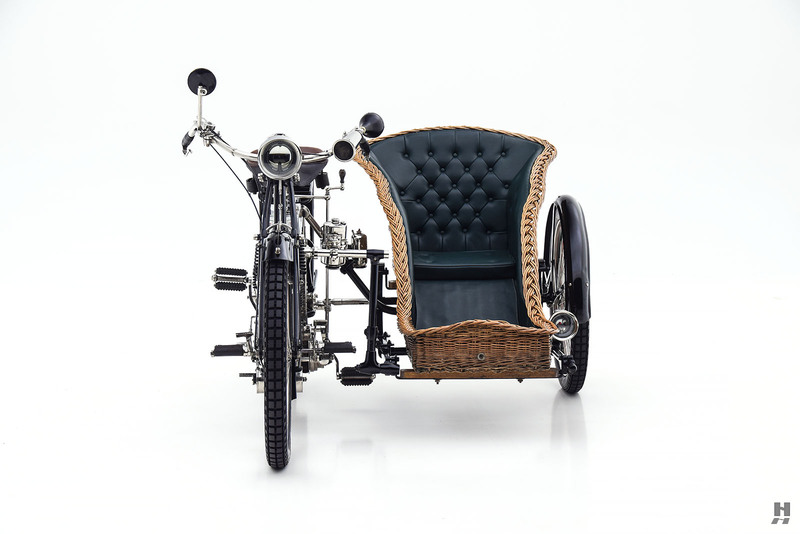 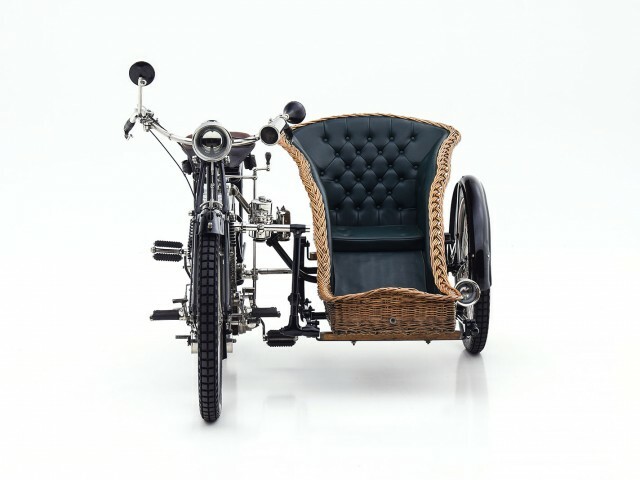 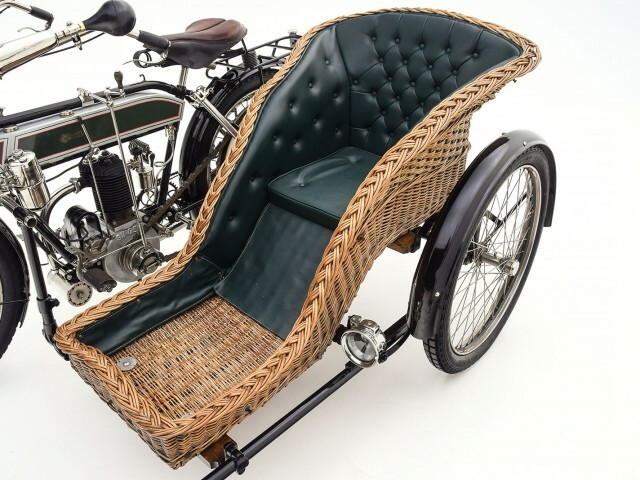 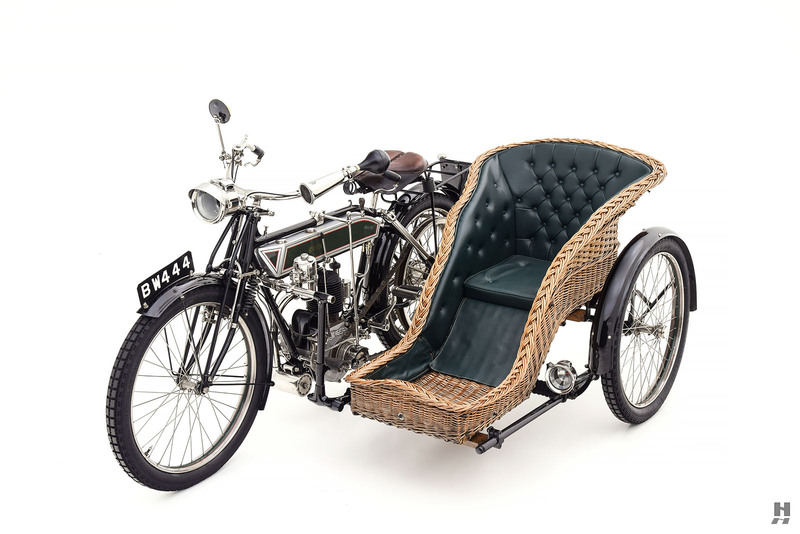 The sidecar is of a high quality but unknown manufacture. 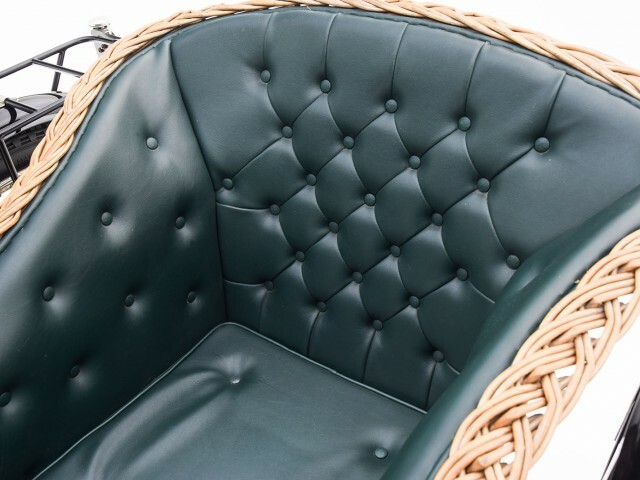 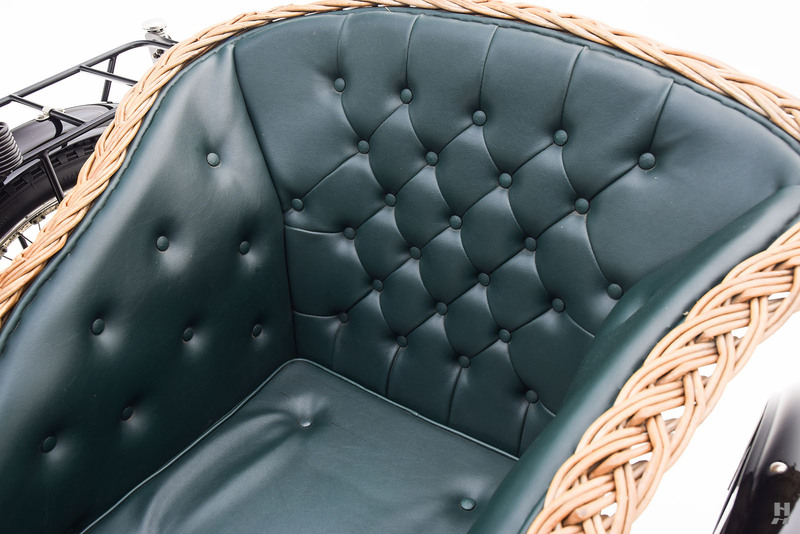 The immediate impression is of a woven wicker chaise lined with green naugahyde, button tufted on the back, sides and seat cushion. 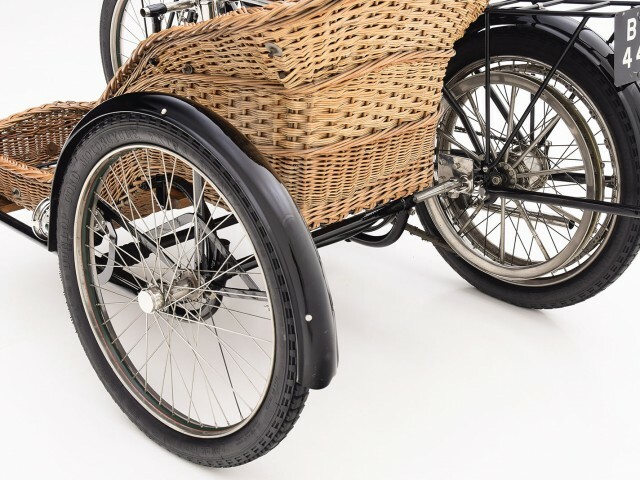 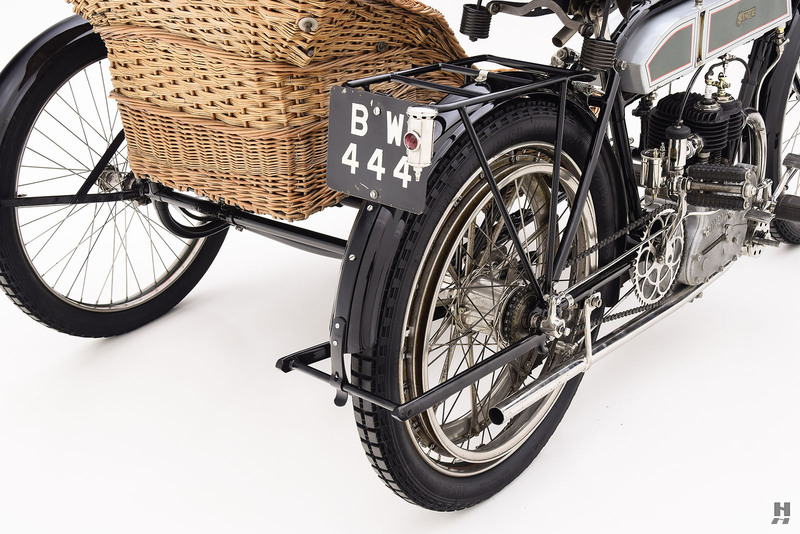 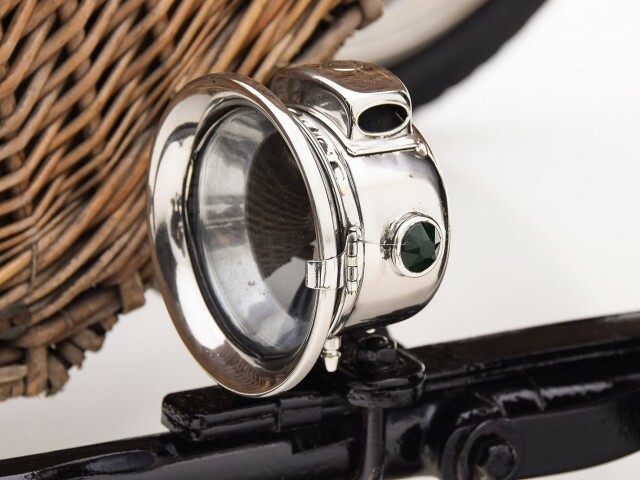 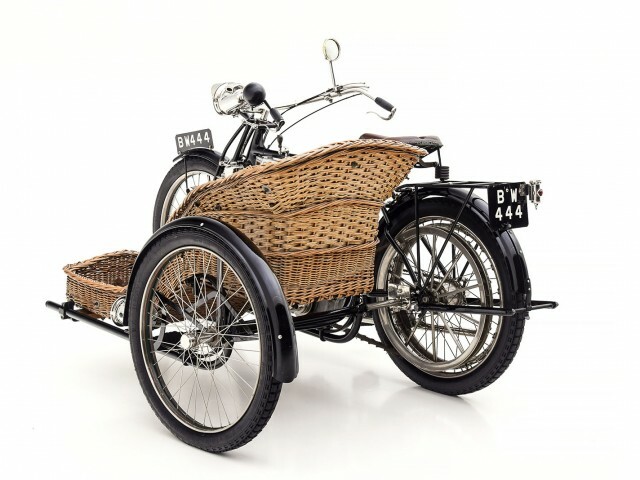 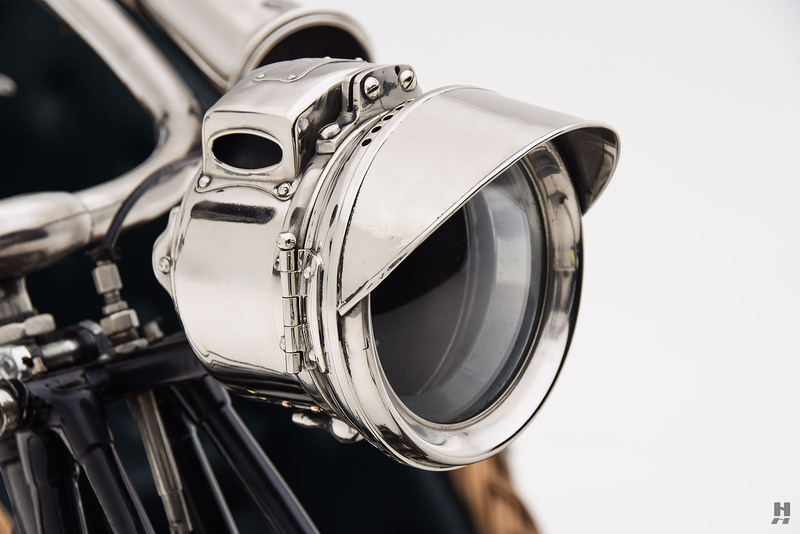 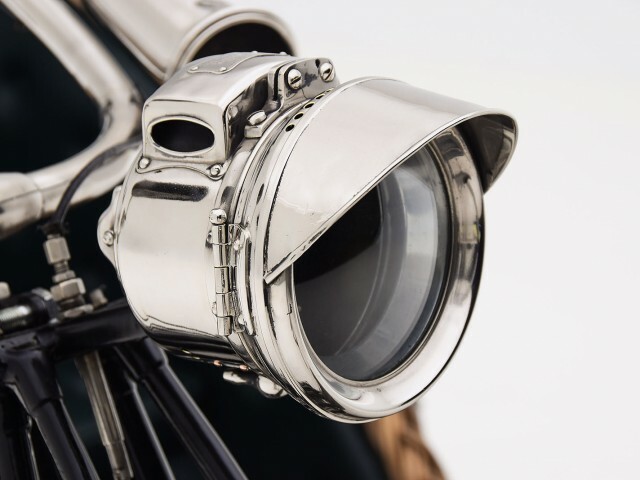 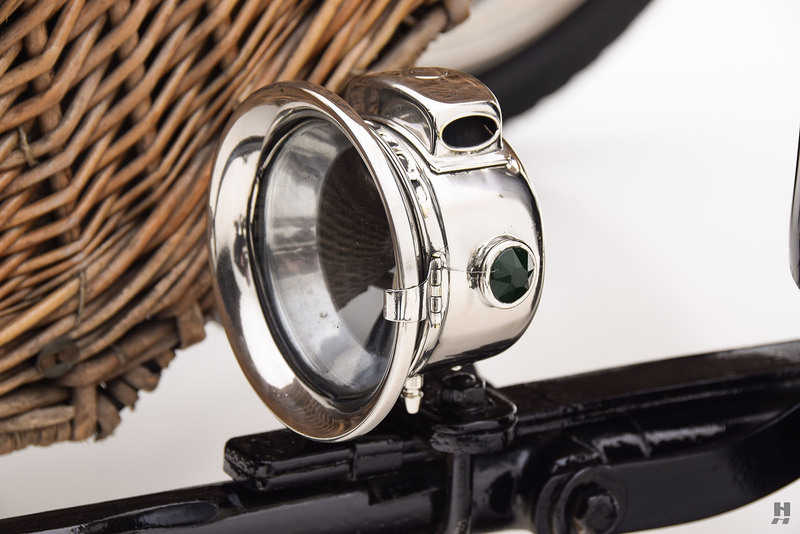 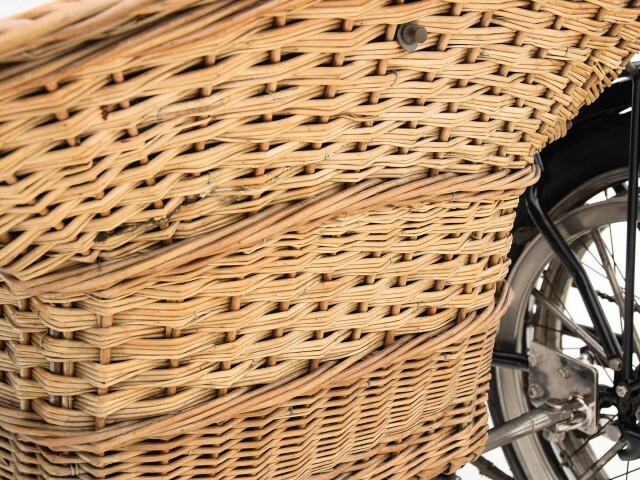 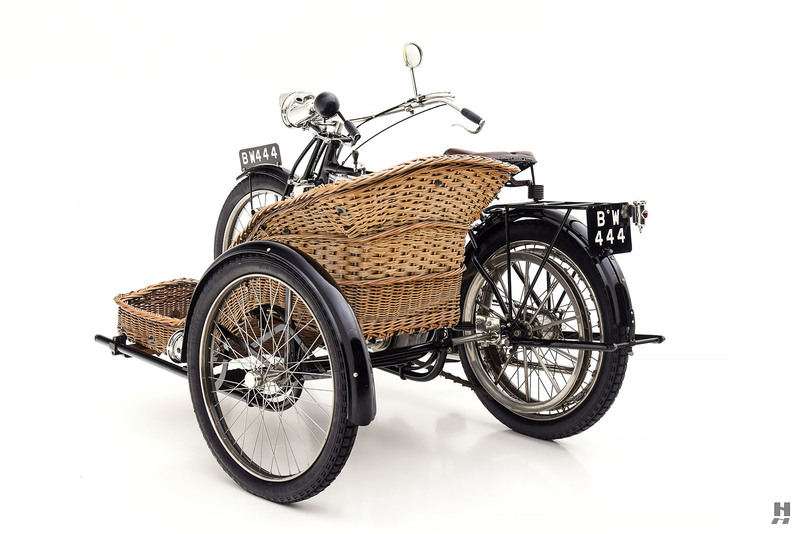 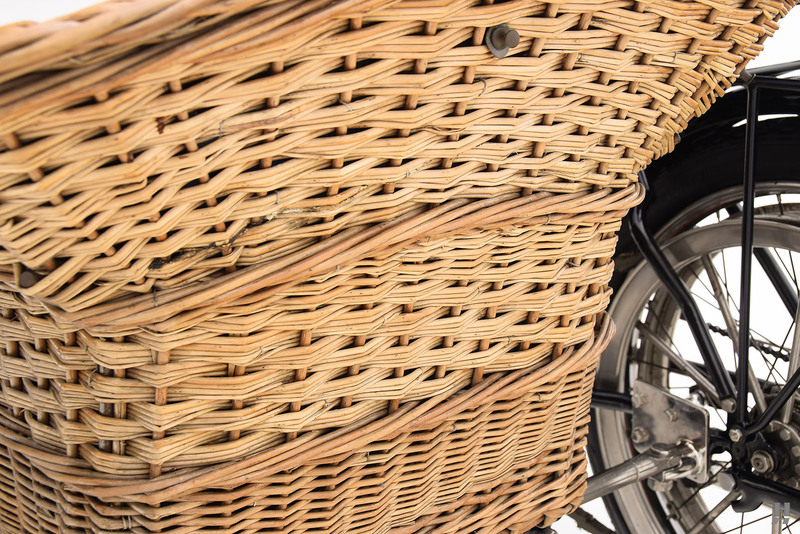 The ‘basket’ is mounted onto a steel frame connecting the rear wheel of the motorcycle to the third wheel, which also features a black cycle fender and a small polished coach lamp. 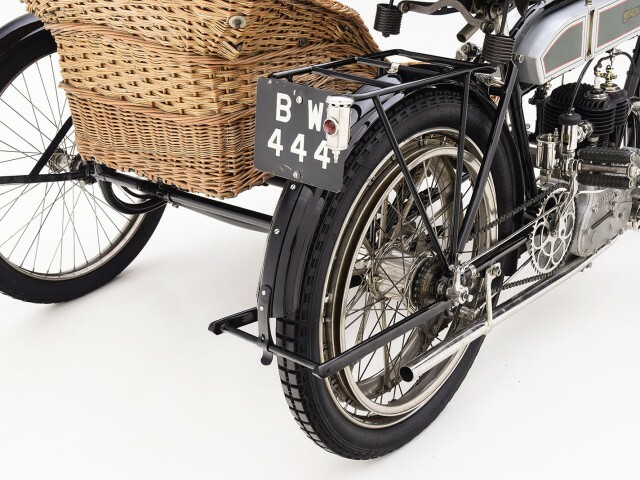 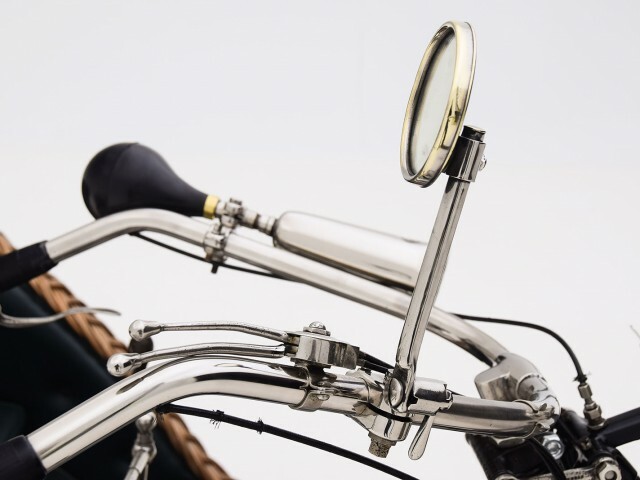 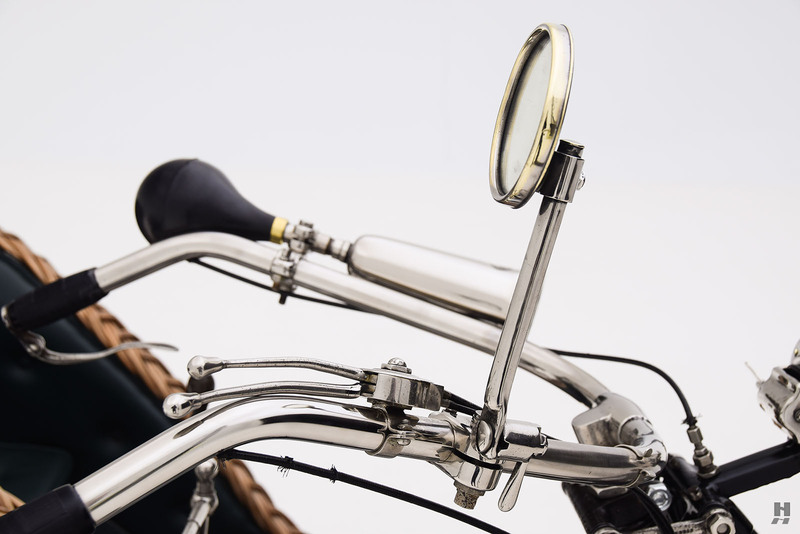 The English registration BW444 remains on the motorcycle, as well as an authentic RAC tax medallion mounted on the polished handle bars. 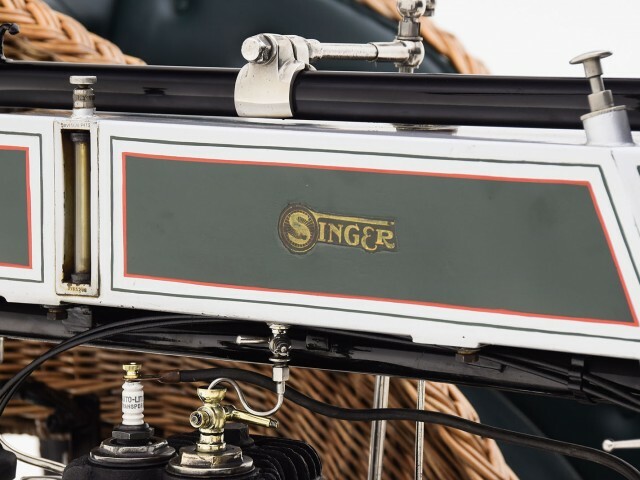 Singer’s first four wheel vehicle was a 2-cylinder automobile in 1905. 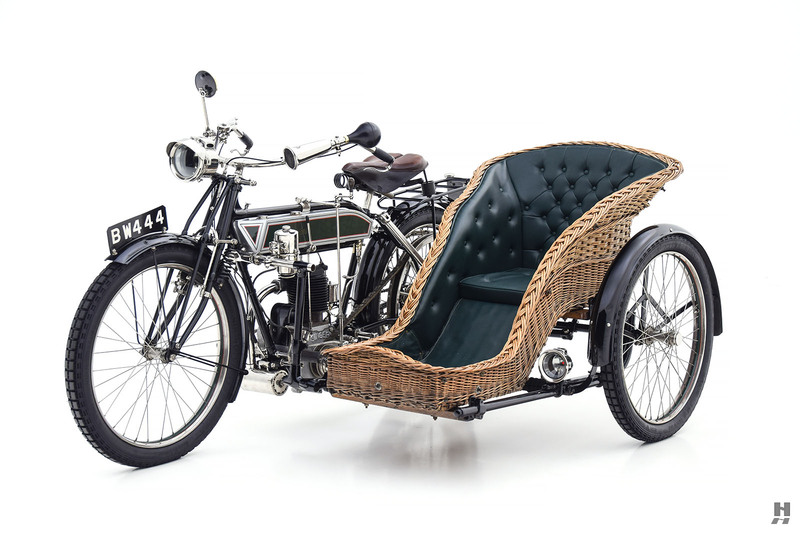 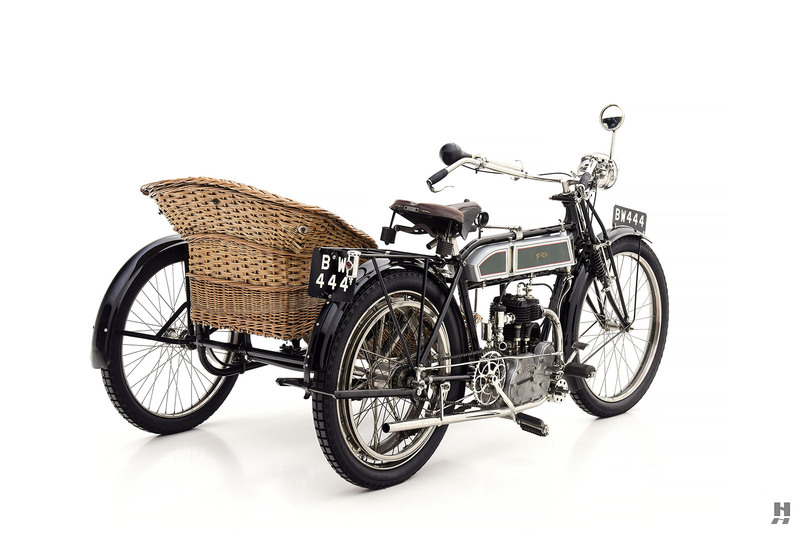 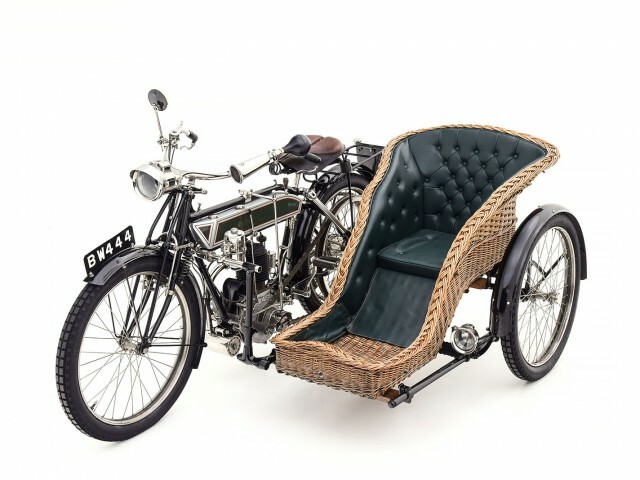 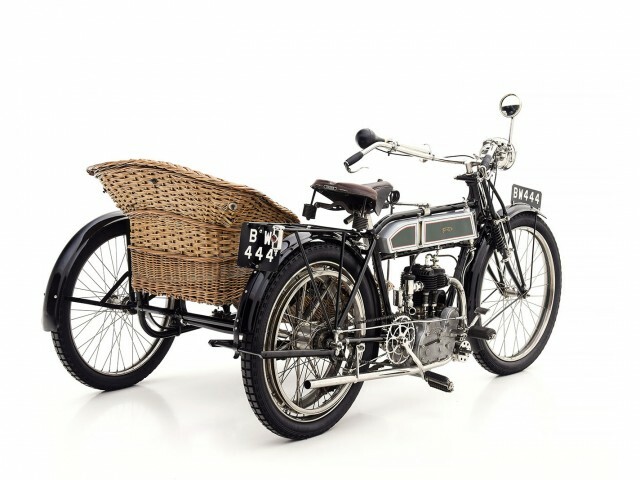 The breakout model for Singer automobiles was the Singer Ten introduced in 1911, the same year as this motorcycle and sidecar combination. 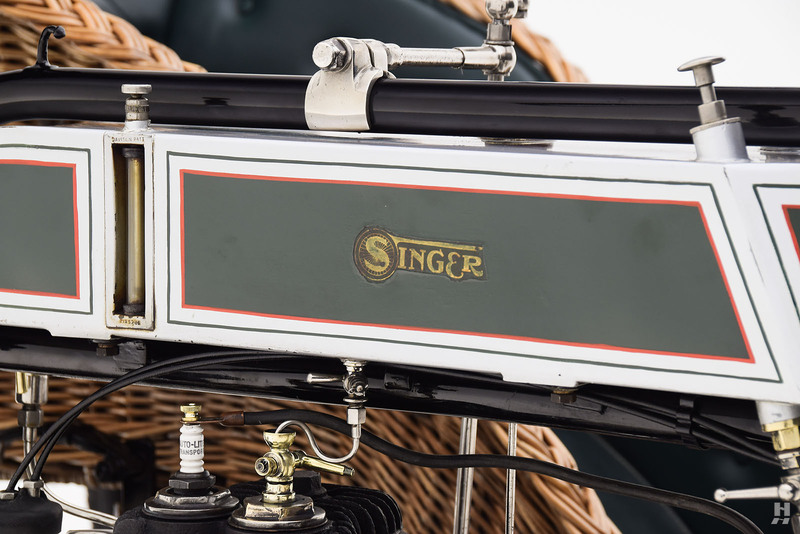 A Singer 10 was driven by Singer sales agent Lionel Martin to victory in the Aston hill climb, bringing all names to widespread public recognition. 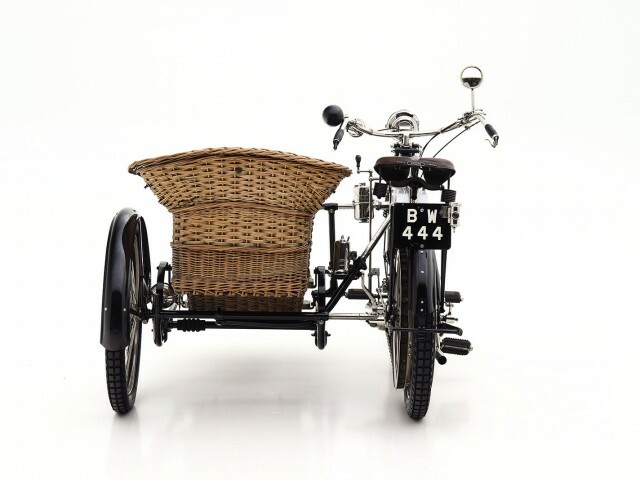 The following year, Martin and partner Robert Bamford introduced the first Aston Martin automobile.